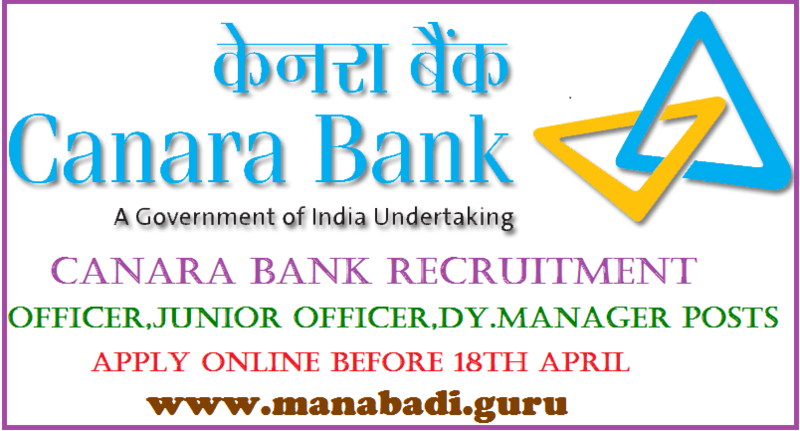 Canara Bank Recruitment 2017,Jr Officer, Officer & Dy Manager Posts,Canara Bank Securities Ltd (CBSL), Canara Bank has releaseds a notification for the recruitment of Officer (Dealer Institutional Desk, Systems Administrator, Network Engineer, Back Office, Research Analyst), Junior Officer (Research Analyst, Dealer Retail Dealing Desk, DP Operations) & Other Vacancies. Eligible candidates can apply in prescribed application format on or before 18-04-2017. Other details like age limit, educational qualification, selection process, application fee & how to apply are given below…. Candidates age limit should be 30 years as on 01-04-2017. Age relaxation is 5 years for SC/ ST s & 3 years for OBC candidates admissible as per rules. Candidates should possess Post Graduation in finance from a recognized University/ Institute, Post Graduation Programme in Securities Markets (PGPSM) from NISM for S.No-1, BE/ B Tech Degree in Computer Science/ Information Technology/ Electronics & Communication Engineering/ Instrumentation or MCA Minimum 60% marks or equivalent grade for S.No-2, 3, Post Graduation in finance from a recognized University/ Institute, Post Graduation Programme in Securities Markets (PGPSM) from NISM for S.No-4, MBA -Finance from a recognised Institute or CFA for S.No-5, 6, Graduation in any stream from a recognized University having secured minimum 60% marks for S.No-7 Posts. For more information refer the notification. Eligible candidates can send applications duly completed in all respects regarding Birth Certificate / SSC / SSLC certificate with DOB, Copies of the mark sheets & certificates from SSC/ SSLC/ X STD, PUC/ 10+2/ Intermediate, Graduation & other qualifications etc., Copies of experience certificates, Caste Certificate of SC / ST / OBC, on a cover should be superscribed as “Application for the selection of _______________- in CBSL” by Registered Post/ Speed Post to The Senior Manager, Canara Bank Securities Ltd, 701, 7TH Floor, Maker Chamber III, Nariman Point, Mumbai – 400021 on or before 18-04-2017. Last Date for Receipt of Application: 18-04-2017. Date of announcement of shortlisted candidates for Interview by Email: 06-05-2017.